Israel's new Attorney General approves controversial "loyalty law" stripping disloyal institutions of state funding. Israel’s new Attorney General, Avichai Mandleblit, green-lighted on Wednesday the controversial bill proposed by Sports and Culture Minister Miri Regev (Likud) that would enable the ministry to strip performing artists and cultural institutions engaging in anti-Israel behavior of government funding, Yediot Ahronot reported. 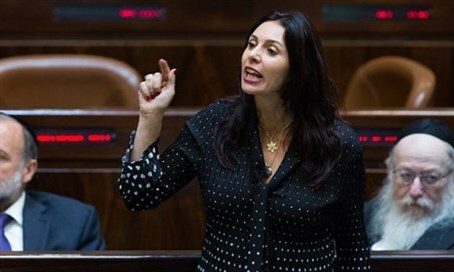 Dubbed the “loyalty law”, the bill would give the Minister of Sports and Culture the discretion to withhold public funds from any institution which displays clear and deliberate disrespect for the State of Israel. Among the criteria listed which could disqualify a cultural institution from receiving government funds are desecration or disrespectful behavior towards the Israeli flag or other state symbols, incitement to racism, incitement to terrorism, rejection of Israel as a Jewish democratic state, and public displays of mourning on Israeli Independence Day. The final category, targeting artists and institutions who mark Israeli Independence Day as a day of mourning, explicitly targets the so-called “Nakba Day” events held in some Israeli Arab institutions condemning the establishment of Israel. Regev’s efforts against anti-Israel performing artists and cultural institutions has earned her the wrath of the Israeli left, which likened her actions to totalitarian censorship.